A monthly journal, giving at a glance, information on the latest in Supreme Court caselaw, important enactments, articles on current legal issues, legal news and news about new publications. The periodical comes from a 67 years old company - highly respected and regarded for its standard, authoritative and reliable publications. 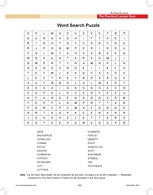 Started in 1974 the publication has since grown in popularity. The Practical Lawyer's readership covers the legal fraternity across India. Its contents relate to the law of the land, and it therefore has a relevance for and is a preferred source of reference in every region and state across India. With its wide network of dealers and distributors backed by experienced sales and marketing staff, the company ensures a nationwide reach of the magazine. Each issue has manifold readership through subscription by the libraries of the Supreme Court, the High Courts and the lower judicial courts, Bar Associations, Institutional, public and private libraries etc. Further, unlike other periodicals which have a short lived shelf life, the issues of The Practical Lawyer have a long life and are preserved and repeatedly used, as its contents have permanent reference value. The Practical Lawyer is mailed every month with a total readership of around 150,000 individuals. 1. 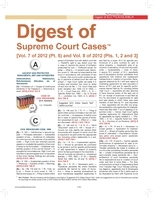 High Recall: The Practical Lawyer™ is not only read as a magazine by the legal fraternity as a source of news and information on the latest developments in law, but it is also kept and maintained as a reference source to refer to the monthly digest of Supreme Court Cases™ which is provided in each issue. Thus each issue is read and re-read by the subscriber/reader several times and carefully bound & preserved. The advertising contained in the Practical Lawyer hence has very high recall, providing the advertiser with a very effective advertising media. 2. Extensive Reach: Among legal magazines in the legal advertising space, The Practical Lawyer™ provides the most extensive reach to the advertiser, covering thousands of lawyers, law schools, the judiciary and government. 3. Customised advertising: When users receive advertising messages that match their interests, the results are dramatic. With the practical lawyer, the advertiser has the option of providing customised advertising that ensures that these messages meet the interests of the legal fraternity and provide immediate results to the advertiser. Corporate advertisers who wish to enter or provide products for this segment, through customised advertising and special offers have been fairly successful. Offering a range of advertising options, including center spreads, posters and tear-outs The Practical Lawyer™ is your one-stop-shop for reaching the entire legal segment. The monthly digest brings you, comprehensive, valuable and authentic information about the latest caselaw of the Supreme Court in digest form. Easy topic and statute guide for quick reference. Digest notes for quick grasp and more points from each judgment. Significant high quality articles, provide insights and observation to readers. 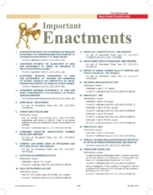 Several of these ground-breaking articles are cited and relied upon by legal professionals. This Section gives exclusive access to the latest legal news coverage, keeping readers abreast of important cases and enactments from across the country. 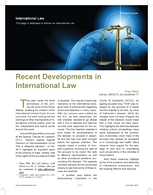 This section covers significant developments over the past month in important and evolving sections of law, such as international law, trade law, constitutional law and intellectual property law. This section covers in brief, important Acts of The Parliament passed over the past month thus the lawyers are kept updated. It covers significant judgments of the courts around India of cases that have made news headlines and will have a significant impact on the development of law across the country. 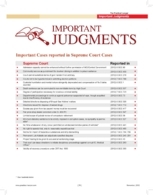 Notable excerpts cover significant observations and insights of judges in various cases at the Supreme Court. The monthly digest brings you, comprehensive, valuable and authentic's information about the latest Supreme Court case law (and LR, WLR & BusLR). At almost no cost, you get a full years Digest, to keep yourself up-to-date! Cheaper than daily newspaper! 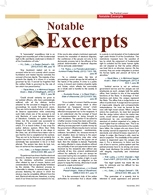 Notable excerpts cover significant observations and insights of judges in various cases at the Supreme Court and High Courts. 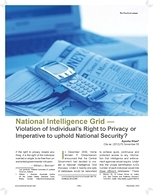 Issues of current importance, are highlighted in each issue. Some of the recent issues that were included are, Alternate Dispute Resolution, the Ayodhya Land Dispute, the Blackberry Services issue, the Goods and Services Tax, the Copyright Amendment (Bill), Cyber Crime, the Role of Media in Justice Delivery, the Information Technology (Amendment) etc. 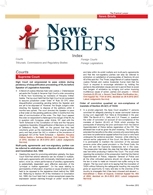 This section covers expert issues on significant developments over the past month in important and evolving sections of law, such as intellectual property law, corporate law etc. This section covers in brief, important Acts of The Parliament passed over the past month. It covers significant judgments of the courts around India that have made news headlines and will have a significant impact on the development of law across the country. This section helps you relax and unwind.